The new 18km Blue Tier trail is incredible. 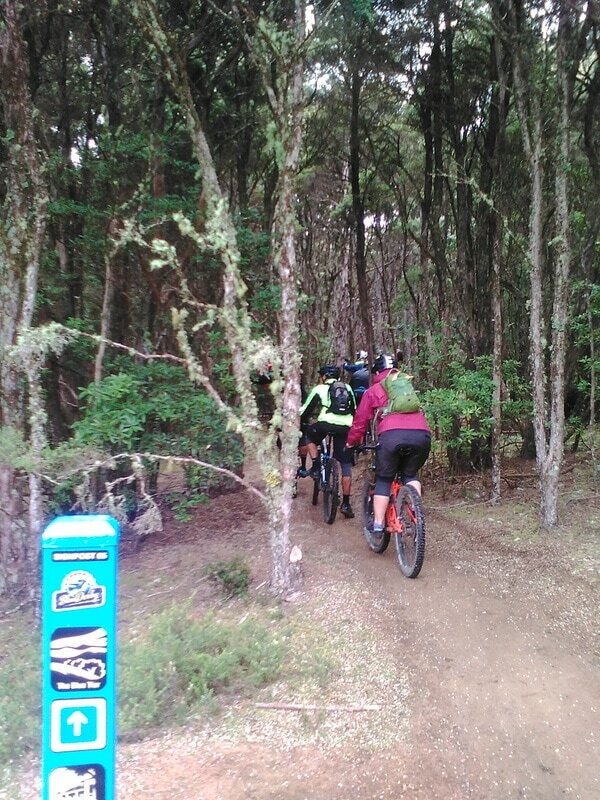 We've spoken to 100s of riders and no one has had a bad word about this trail. This, we understand, is because of two main things, the wilderness the trail travels through and the actual trail design. This trail has about 85% descending. :-). Not steep, so even grandma can ride this trail. But don't be fooled, this is a super epic ride. 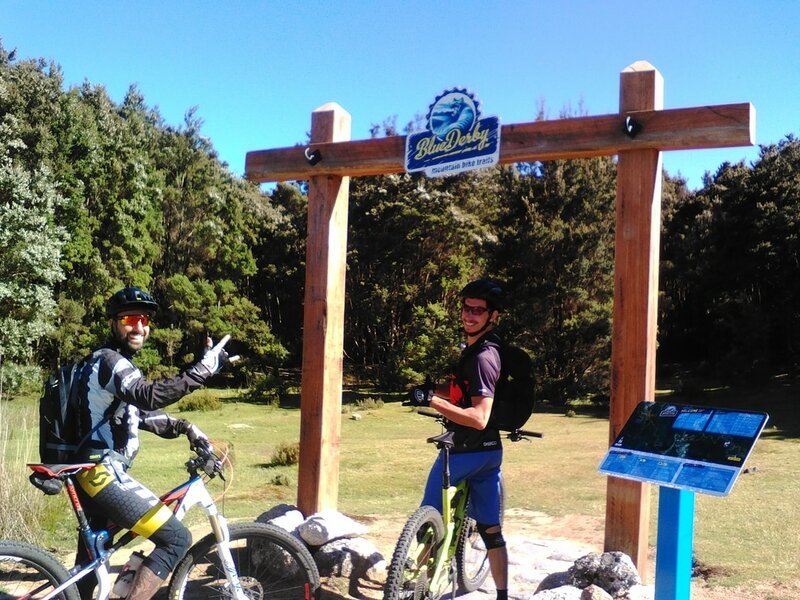 (just beware that it finishes on the Big Chook trail, which is a blue trail. 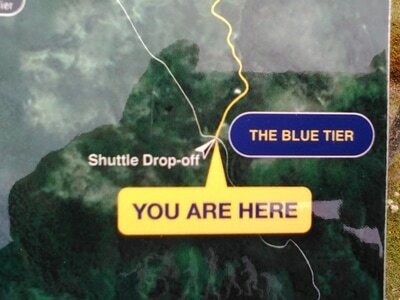 The Blue Tier trail is rated blue, but we'd say it's really a dark green one, at best. It's NOT suitable for beginner riders! Basic MTB bike skills are necessary. The trail can be divided into three distinct sections (although there are no markers to indicate this) and is 18 km long. The ride takes between 50 minutes (flat out - no stops) to 2 hours. The average time is 75 to 90 minutes. Section 1 - Sub-alpine and Myrtle forests. 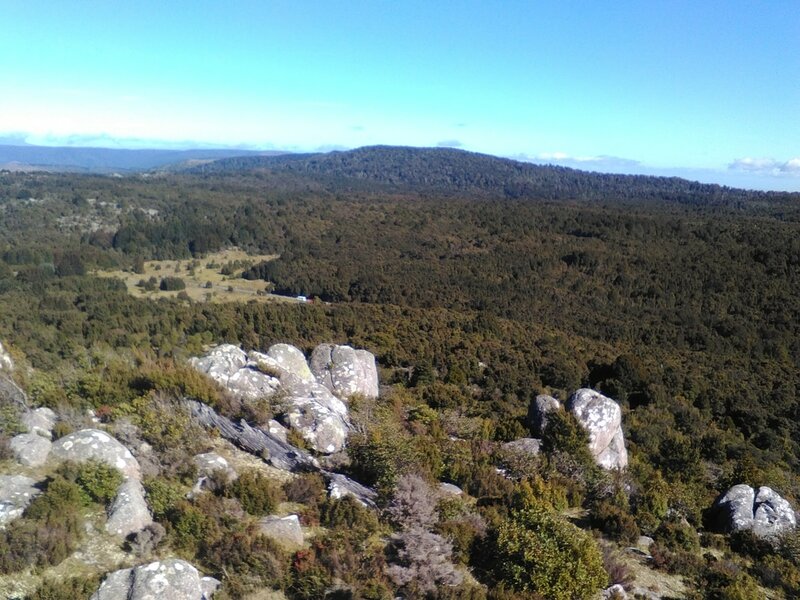 This first section traverses the sub-alpine Blue Tier before following Wellington Creek and its Myrtle forests. The forest section can be muddy. This section is particularly magical. It has a bit of climbing, so be aware! Section 2 - This section beginning with an incredible view across the north coast of Tasmania and is the start of a 20 minute rollercoaster. Super fast and flowy. Smile on your dial stuff. Enjoy! Section 3 - When you things couldn't get better, you find yourself, after a little bit of climbing, on Big Chook. We believe Big Chook is the best trail in the Blue Derby tail network and have ridden it over 80 times ourselves. 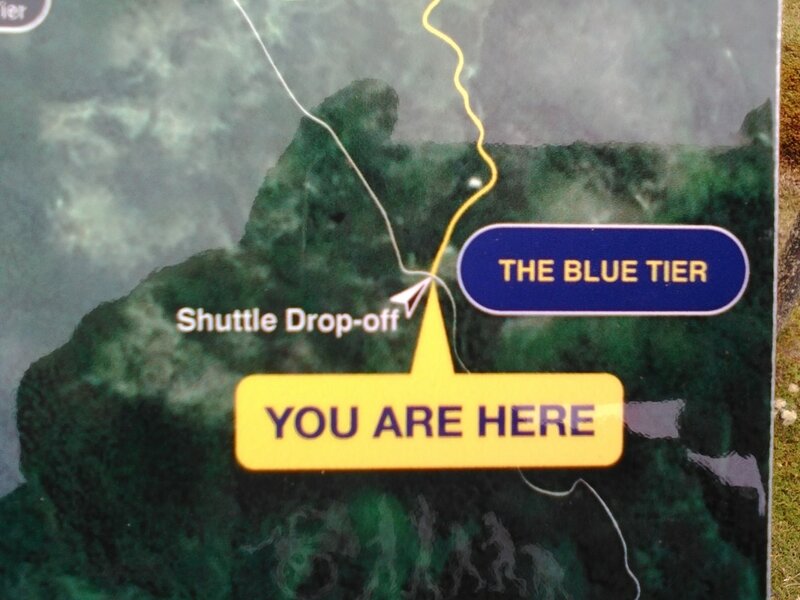 This is how the shuttle company Bus 2 Berms got its name! 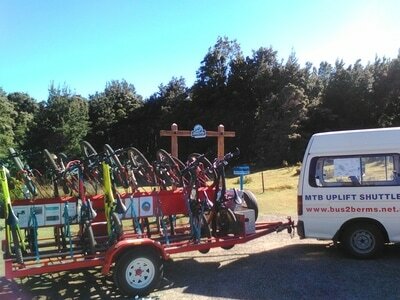 The ride finishes at the pub or you can continue on up Mt Paris Dam Rd (ride or shuttle) and ride Atlas to Derby. See column to right for more details. Big Chook – suit advanced beginner rider up. 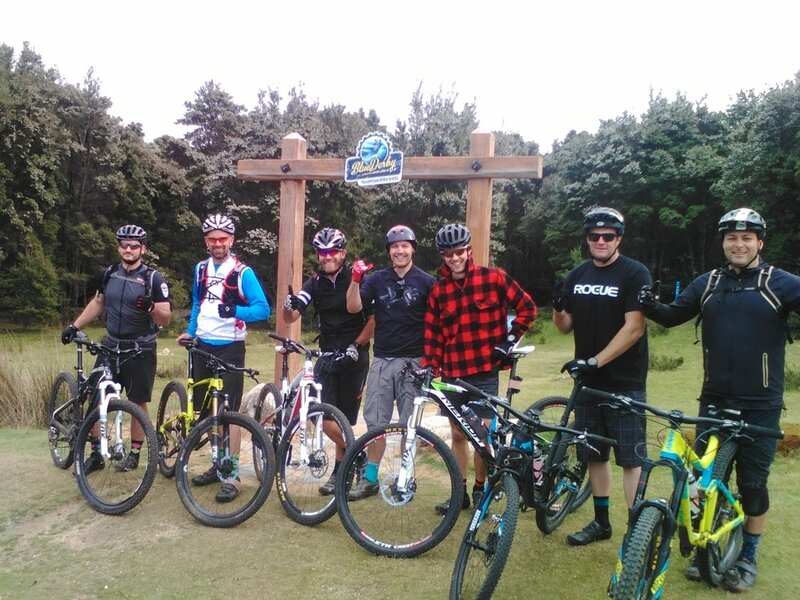 Big Chook is the first part of the Blue Tier Trail to open and is accessed from the southern end (ie. Weldborough Hotel). 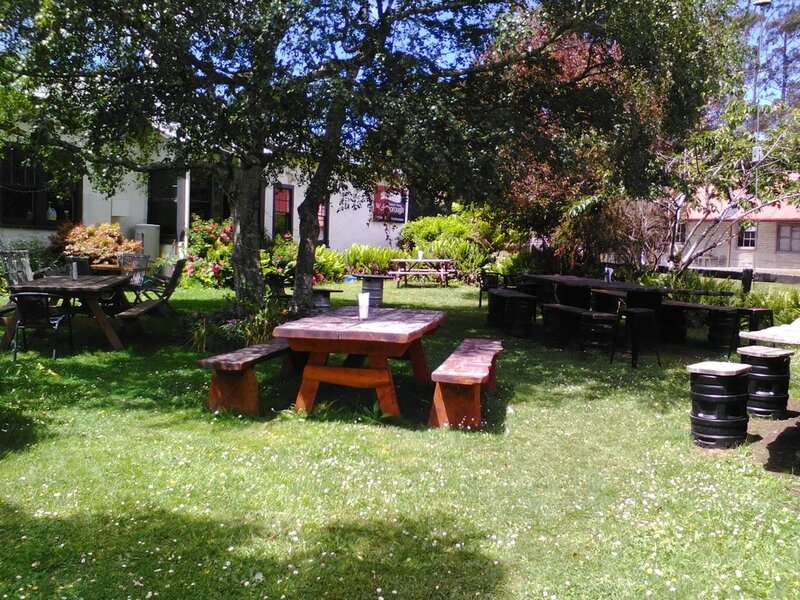 It can be found 4 km from the Weldborough Hotel, down Emu Rd. If heading off from the gate (1 km down Emu Rd) it will be 3 km until you reach the top of the first big climb. The climb requires some fitness and is a little technical. Big Chook itself is a great ride, with a very smooth and flowy trail with berms you can “lose cows in”. The trail would suit intermediate beginners on and is a trail that has a lot of small A line jumps. These jumps would appeal to those that are keen to learn how to find some air, but on safe jumps. The land zones are particularly friendly, with smooth wide zones. It goes through a range of environments with again, heaps of ferns……enjoy. Keen to ride 75km in one day? 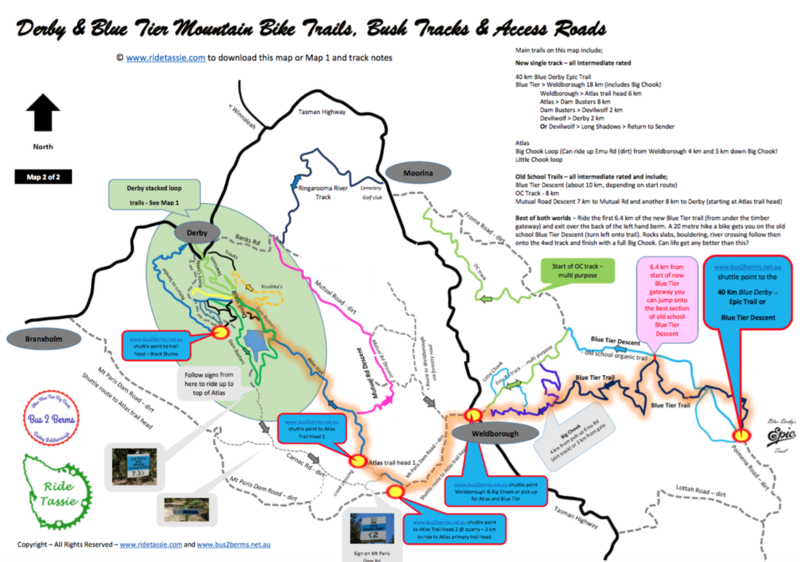 ​You may like to ride from Derby to ride this section of the Blue Tier trail, a quick drink & lunch at pub and then up Mt Paris Dam Road to the Atlas Trail Head. The quickest way to ride to Weldborough is via Banks Rd, at 2.7 km right onto Mutual Rd (after concrete bridge), turn right at 7. 2 km and up first section of Mutual Road Descent and left up forestry rd. Right at top of forestry rd and left when you hit the Weldborough sign. All up, this is a 14 km ride. (Zero speedo at start of River Track at signage at shower trail head). Alternatively, ride via Atlas ride route, but head right before final pinch and ride towards quarry and then down Mt Paris dam Rd to Weldborough. This is about 19 km. A great green trail about 1 km along the trail to Big Chook. 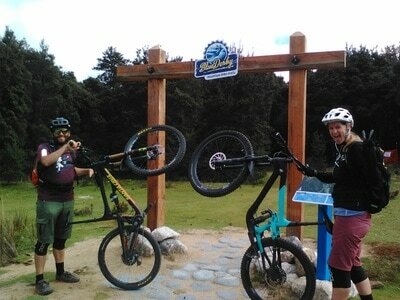 This is probably the best green trail in the network and gives you a little of what riders experience riding the new Blue Tier Trail. Please note - Little Chook spits you out on the last 500 metres of Big Chook, which is not a green trail, so caution is advised.